With the hot weather upon us, staying hydrated is really important. To help stay hydrated, try these recipes for flavored water from The Most Effective Ways to Live Longer Cookbook. Also, click on the page below for a delicious recipe for banana breakfast bars! Eat, drink, and be healthy at any age with these delicious recipes! Fight oxidative damage caused by free radicals, which wears you down from the inside out. Stop the silent killer of inflammation. Reduce the damage caused by sugar molecules, known as glycation. Relieve mental, physical, and emotional stress. 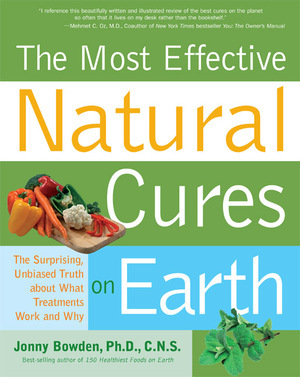 Acclaimed nutritionist Jonny Bowden, Ph.D., C.N.S., and chef Jeannette Bessinger, C.H.H.C., have crafted more than 140 flavorful, mouth-watering recipes loaded with antioxidants, anti-inflammatory properties, vitamins, minerals, and other key nutritional components that fight the effects of aging, prevent disease, and help you feel your best every day. Try Heart-Healthy Mega Omega Fettuccine Alfredo, Immune Boon Kung Pao Chicken Soup, Hike ’n’ Bike Trail Mix, Antioxidant Almond Nog, and Chocolate–Vitamin C Fruit Salad. Using delicious ingredients and smart, healthy cooking methods, Chef Jeannette transforms everyday food—and some comfort foods—into delicious dishes! Tasty Friday is brought to you today by the book The 150 Healthiest Slow Cooker Recipes on Earth which features a yummy recipe for pureed white bean dip with rosemary oil along with how to make your own rosemary oil infusion. Click on this page from The 150 Healthiest Slow Cooker Recipes on Earth to enlarge and get the full recipe for pureed white bean dip with rosemary oil and all its nutritional info! Discover how to make mouth-watering, super-healthy, and super-convenient slow-cooked meals! Nationally-known nutritionist Jonny Bowden, Ph.D., C.N.S., and chef Jeannette Bessinger, C.H.H.C., take slow cooking to a whole new level with these easy, nutritious, and deliciously satisfying recipes! The “clean foods team” of Dr. Jonny and Chef Jeannette use wholesome ingredients, such as fresh fruit and vegetables, grass-fed beef, wild-caught fish, and pasture-raised poultry in their recipes. Losing none of the convenience, they skip the high-sodium canned food “products” used in many slow cooker recipes and bring you dishes with both traditional and ethnic flair. Try the Real Deal Beef Stew with Orange and Clove, the Quick Sesame Teriyaki Low-Carb Lettuce Wraps, the Hot and Hearty Red, White, and Blue Crab Dip, or the Gingered Honey Pears with Cinnamon Sticks. Bon appetit! 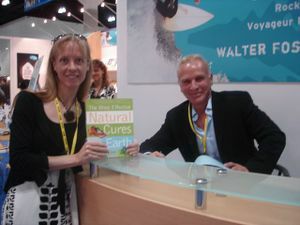 Jonny Bowden, Ph.D., C.N.S., www.jonnybowden.com, a board-certified nutritionist, is a nationally known expert on nutrition, weight loss, and health. Jeannette Bessinger, C.H.H.C., the Clean Food Coach, www.thecleanfoodcoach.com, is an award-winning nutrition educator and personal whole foods chef. I am ending this week with a little break from my usual crafting subject matter, although cooking is definitely creative and I am a firm believer in that the better we eat the more creative we can be. How? The nutrients in these foods—from vitamins A, B, and C to the minerals iron and zinc—act as powerful antioxidants, neutralizing the free radicals that form in your skin due to sun exposure, environmental toxins, and a poor diet. The entire body needs these antioxidants in order to work properly and give us the glowing, healthy appearance we crave. -Why some surprising foods—like chocolate, eggs, and maple syrup—don’t deserve all the bad press and why your skin needs them. In addition, you’ll also find fifty delicious recipes specially formulated to improve your complexion. Each recipe contains at least one of the 100 featured foods, making it easier than ever to get your skin-healthy lifestyle started. Become your most beautiful the natural way—with Feed Your Skin, Starve Your Wrinkles. Allison is quoted throughout the article "Beauty Boosting Foods" in the April issue of Better Nutrition magazine. Roasted chickpeas sound positively yummy! Click on the image to enlarge and read the nutritional information for chickpeas. Do you bake or cook from scratch? Or are you more of pour out of a box/heat up kinda person? Do you follow recipes or wing it? As a thanks for answering your entered to win a free book! Have a creative and tasty weekend. New in paperback, with CD-ROM! 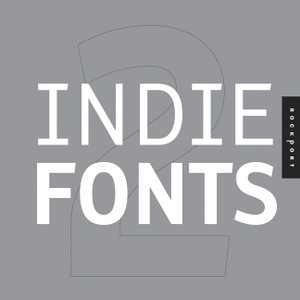 If your hunger for new fonts is insatiable, then Indie Fonts 2 is the book for you. It is the second installment in Rockport’s Indie Fonts series and brings you even more fonts to choose from. Don’t settle for ordinary fonts when you can capture your reader’s attention with an original font that hasn’t been become overused and boring. Indie Fonts 2 includes more than 1600 diverse fonts from 19 of today’s hottest digital type foundries and features the best work of these designers. This comprehensive collection helps designers do their jobs even better by providing some of the highest quality fonts available today. The type styles range from the best of Matthew Carter’s classic designs to the latest irreverence of ingoFonts. Designers searching for unique typefaces will find what they are looking for, whether historical revivals or futuristic techno faces. On the included CD, you'll also get a collection of 38 fonts. Richard Deglar, James Grieshaber and Tamye Riggs from P22 type foundry create computer typefaces inspired by art, history, and science. P22 is renowned for its work with museums and foundations to ensure the development of accurate historical typefaces that are fully relevant for today’s computer user. In addition to its in-house font design, P22 now licenses several new type designs from around the world. And, of course, no type foundry is complete without its own record label. So my friend's birthday is Sunday and we are having another craft/birthday party. The theme is disco glitter. I went to the disc of free fonts in Indie Fonts 2 and I thought Annabelle Matinee NF would be fabulous. To make an easy banner simply type one letter on the page. I happen to work in Illustrator. I also wanted the ability to fill in the space of the letter with all sorts of stuff (check back for our craftiness) so I selected the letter and then the outline box, gave it a fill of black and increased the outline width to 4 points. I then selected the fill box and selected "none"
This gave me the outline of the letter. I then printed each letter out individually. This works great for any banner you might need to make! And on the subject of parties, as always there is food. 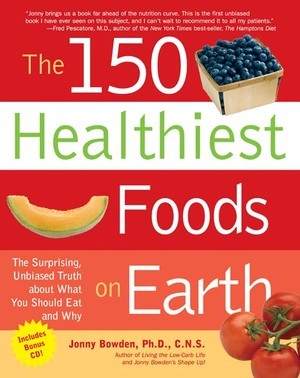 And on the subject of food, pop on over to this article at the New York Times about the The 11 Best Foods You Aren’t Eating with our very own Author of 150 Healthiest Foods on Earth and The Most Effective Natural Cures on Earth among others, Dr. Jonny Bowden. The list will surprise you! 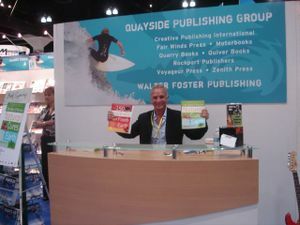 I spent the last three days at BEA-Book Expo America and what a great time I had! Our Quayside booth was beautiful and sparkly! Jonny Bowden, Ph.D., C.N.S., is a nationally known expert on weight loss and nutrition and is author of 150 Healthiest Foods on Earth. He has been featured in the New York Times, Time Magazine, GQ, Muscle and Fitness, Self, Fitness, Men's Health, Prevention, In Style, and Shape, among others. He lives in Woodland Hills, CA. Visit www.jonnybowden.com. 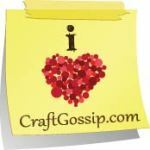 I will post lots of pictures so you can get an idea of what it's like and mixed in I will share with you the "Crafty Bloggers" Linky Love for the week. I would have to say most of the star sightings were unexpected! 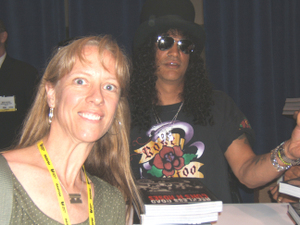 Yes-that is me and SLASH!!!!! From Guns N' Roses, I know I look dorky but hey, the security guard doesn't care, he's just trying to keep the line moving! The Fairies have landed at Aileen's Musings! Check out her Mini Fairy Birdhouse tutorial and maybe you too can capture a fairy or two! 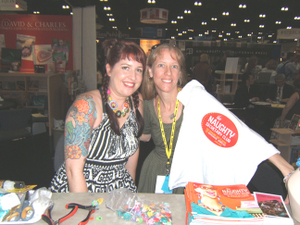 Love books and beads? Then you'll love this call for entries from Interweave Press. Stitch up quick Cross Stitch bling using floss and plastic canvas. Kathy gets crafty with words and shares a cautionary tale about the perils of cake in the office. The year-long Bead Journal Project is winding down, and Cyndi is thrilled to be finished!! Here's the scoop on making your own polymer clay buttons. Another rock star I got to hang with was the Naughty Secretary herself Jennifer Perkins. Pop on over to her blog to see her adventures from the weekend. Over at Sweater Surgery there are a bunch of cross stitch sayings and note cards made from photos of the sayings. Join The Impatient Crafter Margot Potter in this cheeky video tutorial on making UTEE glittered skull jewelry. It's magically craftlicious! 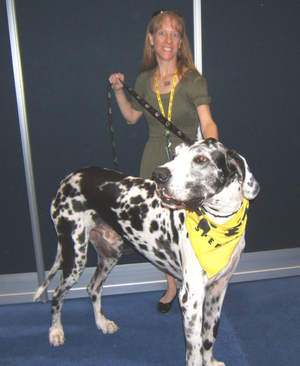 And just to round out today's post here I am with The Guinness Book of World Records Tallest Dog-Gibson. 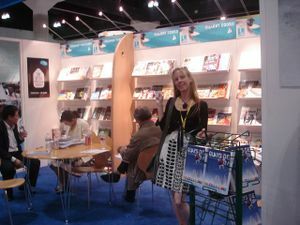 Why was Gibson at BEA? Why here "wrote" a book with his best buddy Sandy Hall. He was wonderful and sweet. 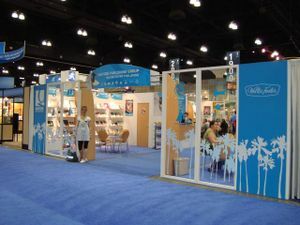 Stay tuned for more BEA star sightings with lots of crafty goodness! 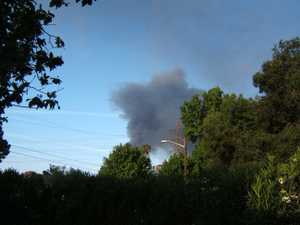 And on another note I thought I'd share with you the view of the Universal City Fire from my front yard. Read, craft and stay out of the fire!